Well, summer "vacation" is in full swing and the adjustment has been interesting. I'm sure we will find our rhythm eventually. 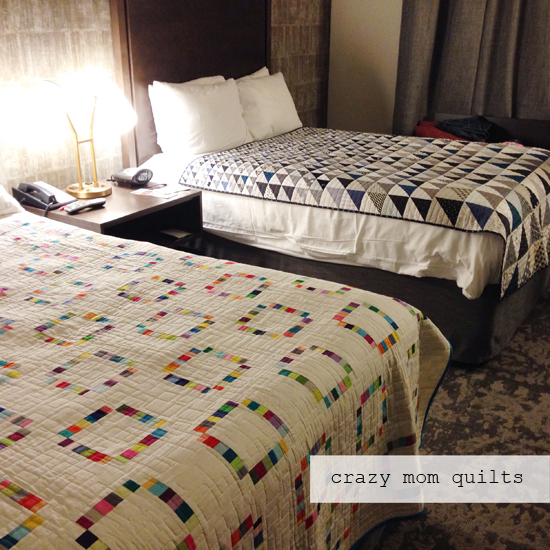 To cope, I decided to start a new quilt for my king sized bed. Sounds like a great idea, doesn't it? I started this project on Saturday and I've been slowly picking away at it as time and energy allows. 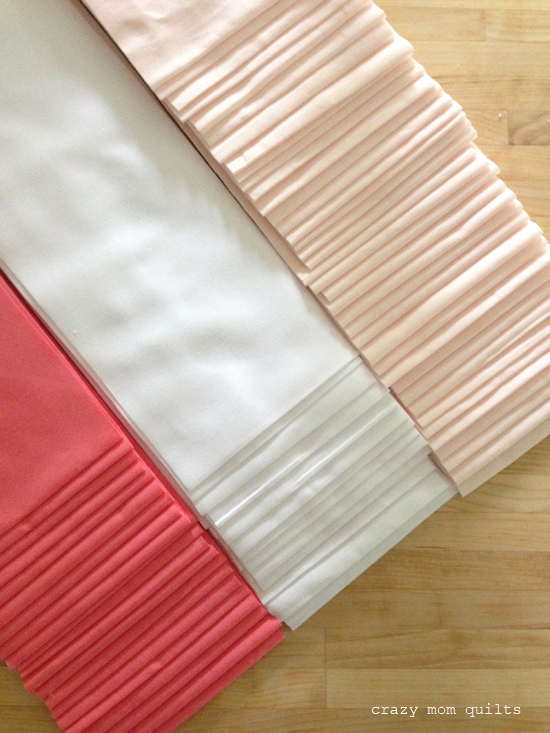 I'm only using 3 colors: white, pearl pink and pink flamingo. 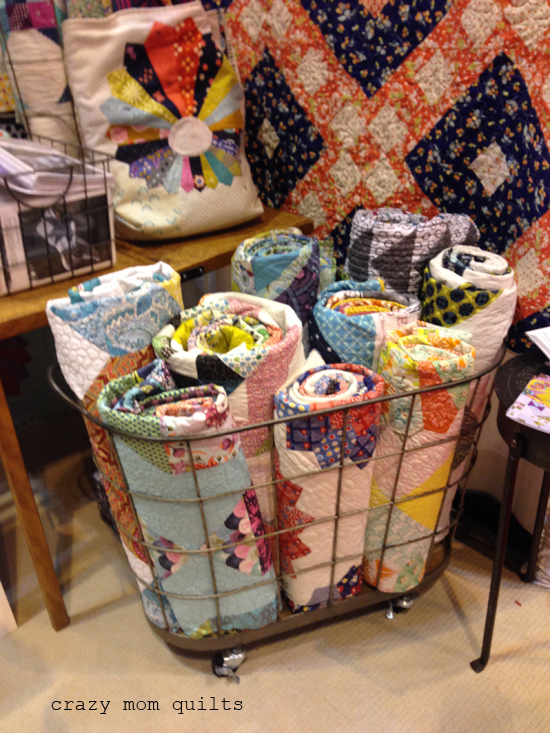 All of the fabrics are Kona cotton. Pink flamingo, as you may know, is the Kona color of the year. It's quite pretty! 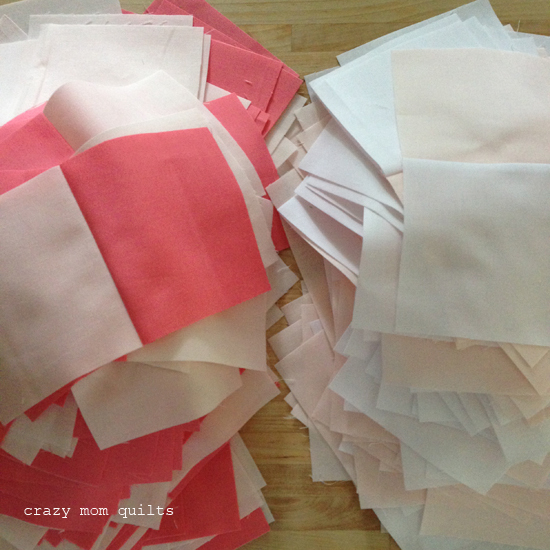 I was thinking about making a gingham quilt with pink flamingo for a few months. 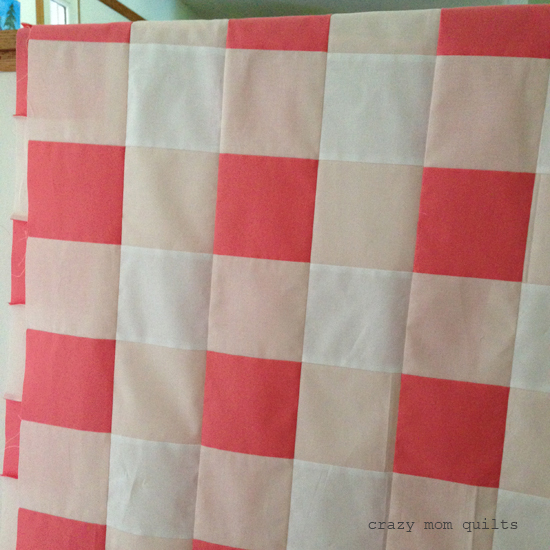 When I found 5 yards of the pearl pink in my stash, which matches quite nicely, I took it as a sign that the gingham quilt needed to be made. Hahaha! 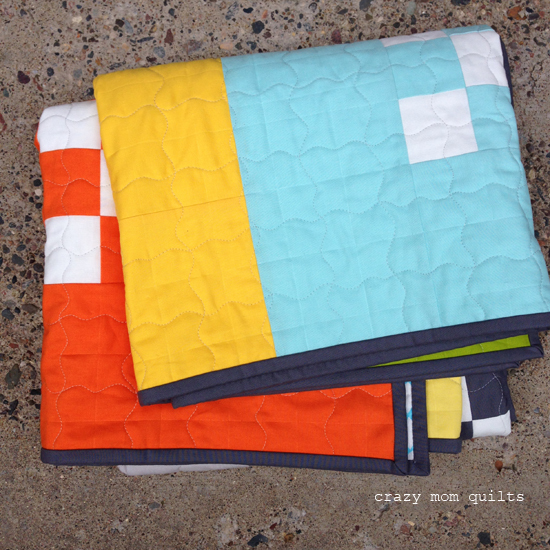 It's rare that I cut out a quilt completely before I start sewing, but that's exactly what I did this time. It's good to change things up! 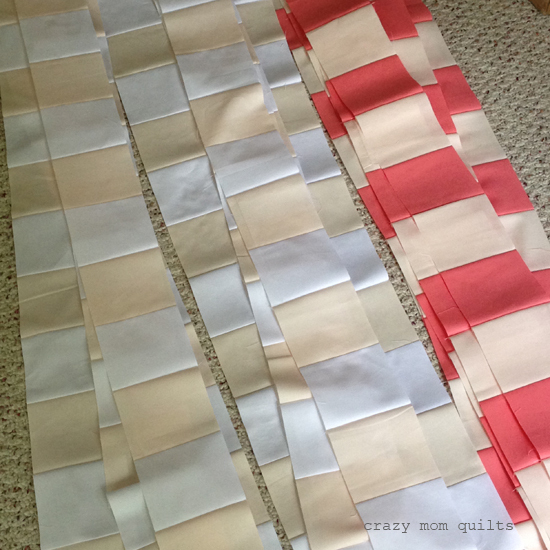 It took me over an hour to sew all those strips into pairs. 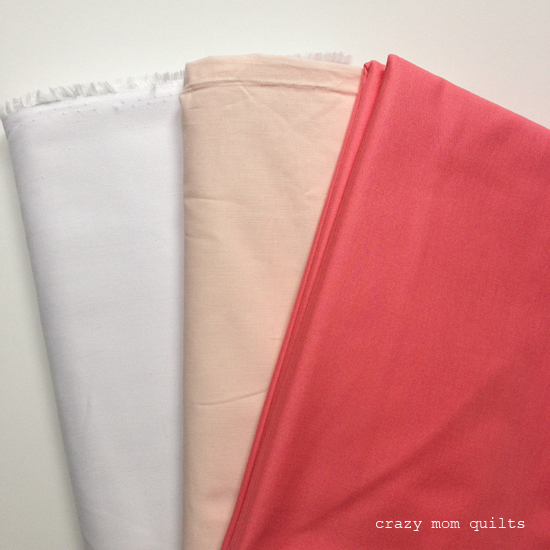 It was a lot of fun to feed so much fabric through the machine at such a rapid pace. Chopping everything into segments took quite a while! 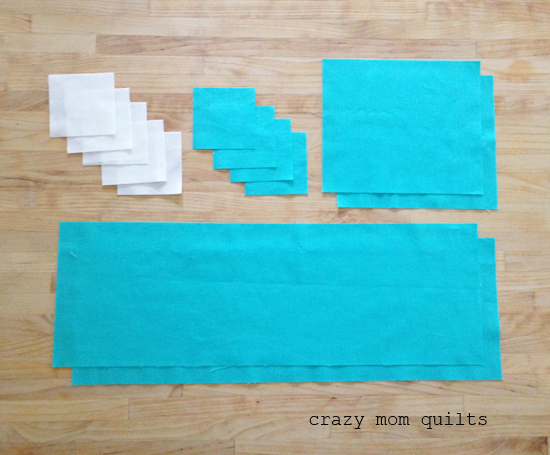 The rows are LONG when you are making a king size quilt! Holy moly! 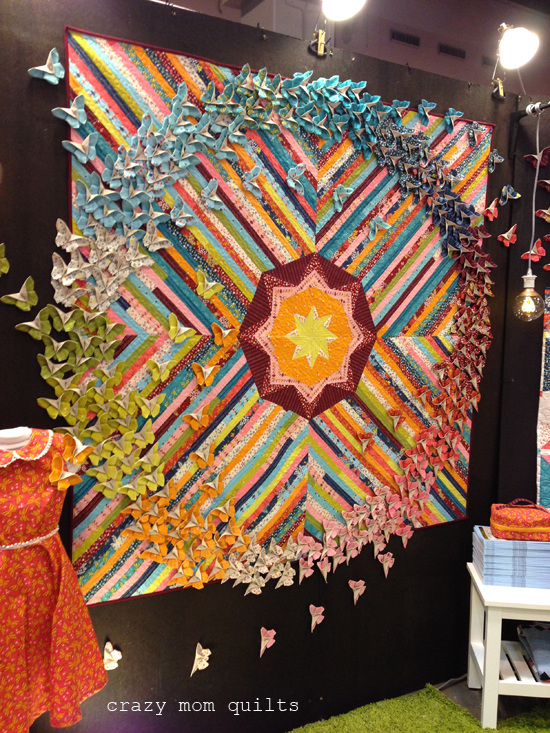 It was quite exciting to see the first several rows sewn together. 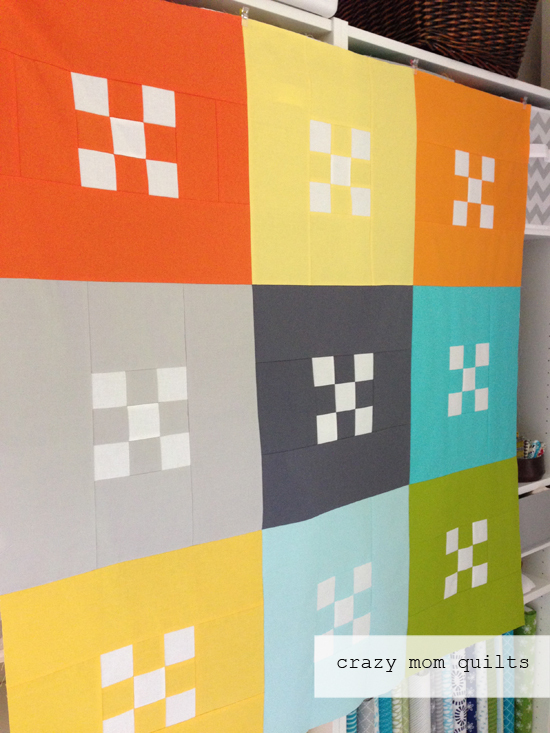 It's going to be such a fun quilt! Now that I look at it, I probably should have picked a darker shade than the pearl pink, but I still think it's going to be fine. And hey, I'm using my stash, so that counts for something, right? 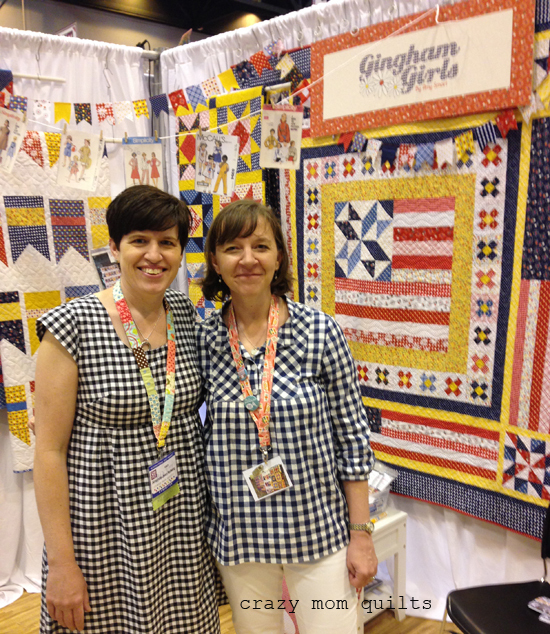 I actually made another gingham quilt in gray and white... way back in 2011! It's fun to be revisiting this pattern again. It's been much less frustrating this time around, mainly because I learned that a short stitch length is essential when strip piecing. It sure makes a difference! 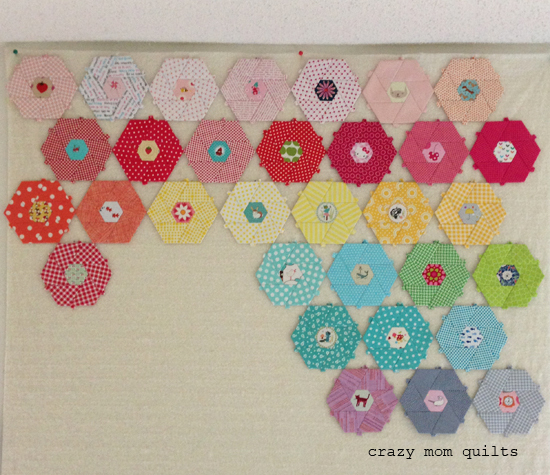 I hope to have a finished quilt top to share with you soon! 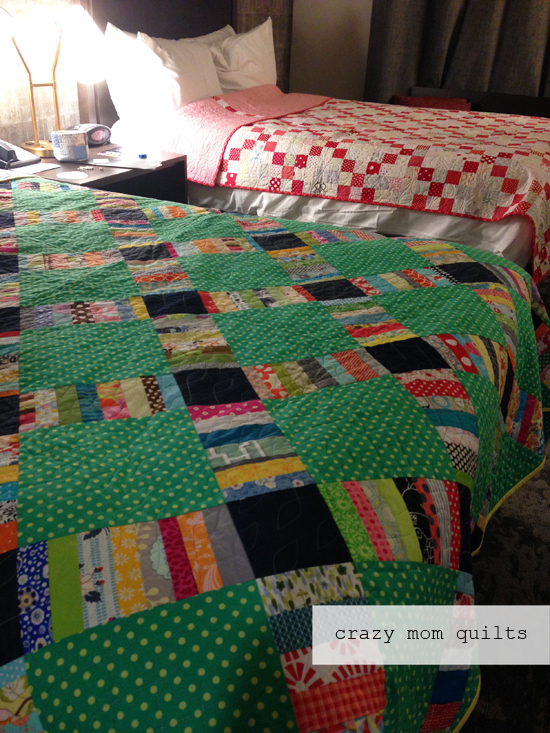 Yesterday morning I pieced a back and basted the quilt. 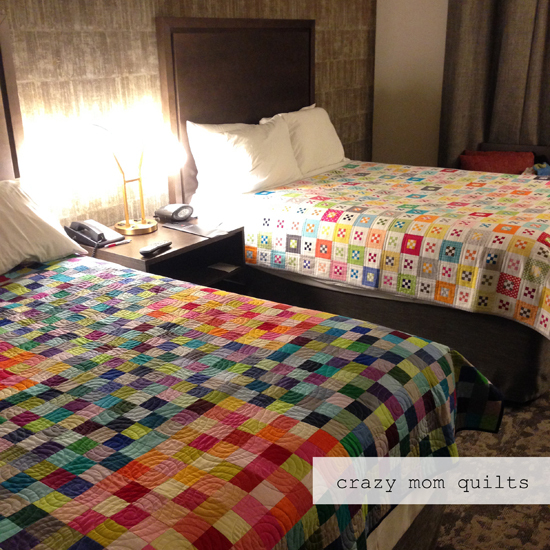 It didn't take very long to quilt it, which was great. 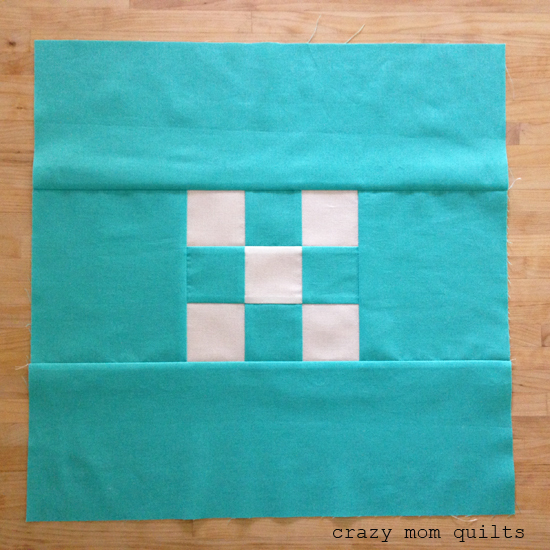 I kept the quilting simple by doing some free motion wavy lines to form a grid. 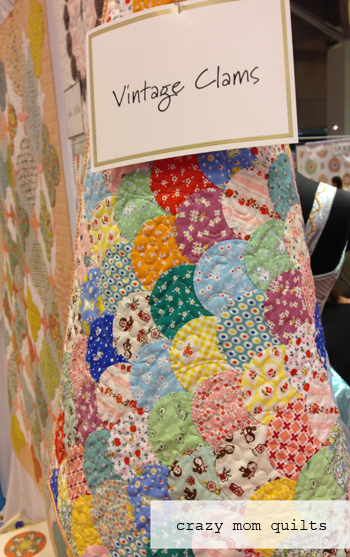 I love this type of quilting. It's easy and quick and forgiving. It also adds a nice texture to the entire piece. This fabric is from my good neighbors collection. It matched perfectly and works very well on the back. 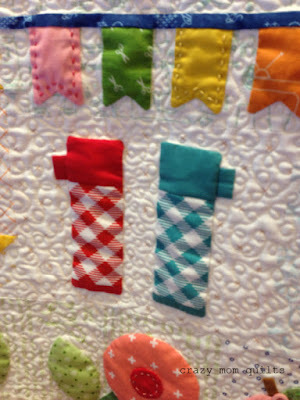 There is a simple tutorial for the big nines block here, if you care to make one of your own. I've been recovering from quilt market by spending some couch time hand stitching on my focus blocks. (Templates are available here.) It's been gloomy and cold here, too, so that's about all I want to do! 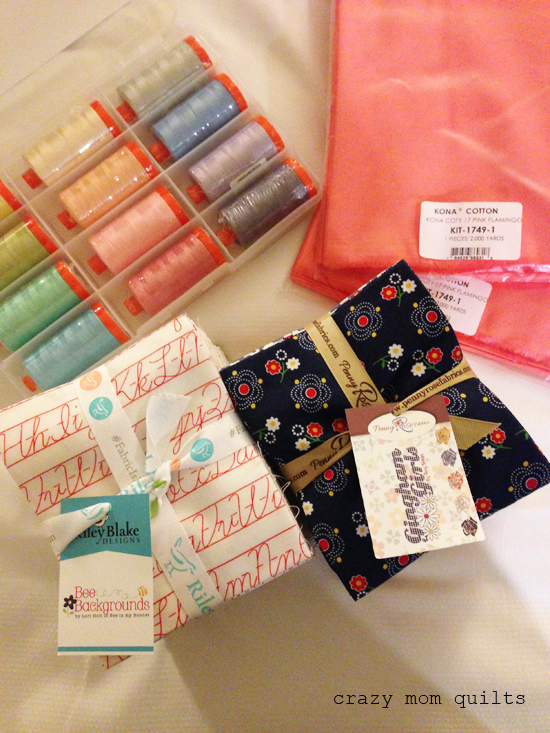 Thank goodness for cute fabric and time to recharge (at least a little bit!) before the kids are done with school for the year. Only 1 more school day left! 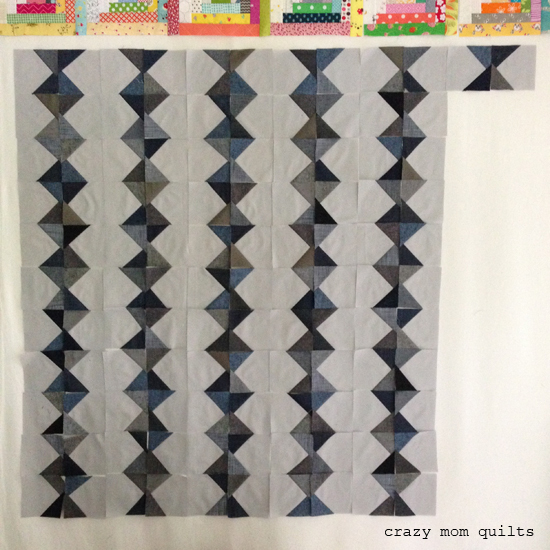 I stitched up as many blocks as I could for my moody quilt. I ran out of background fabric, so I'm at a temporary stand-still until I can purchase more background fabric. 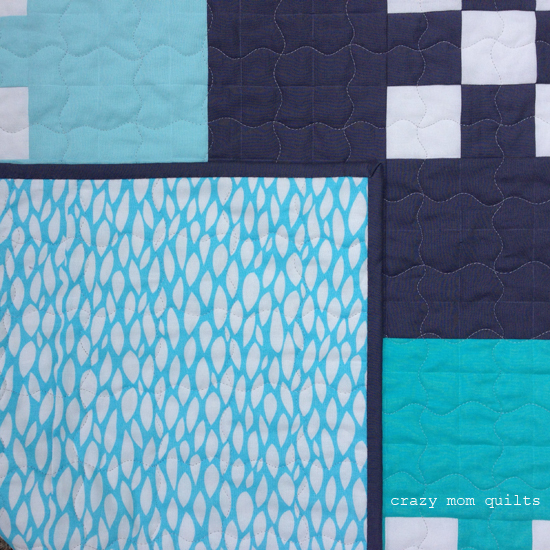 This quilt needs to be at least lap size, because I am loving it so far! 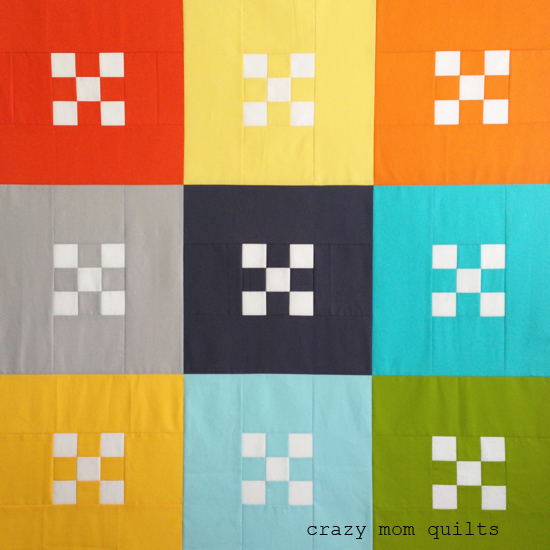 (More details on this quilt can be found in this post.) I had to laugh at the colorful log cabin blocks peeking out from the top of the photo. 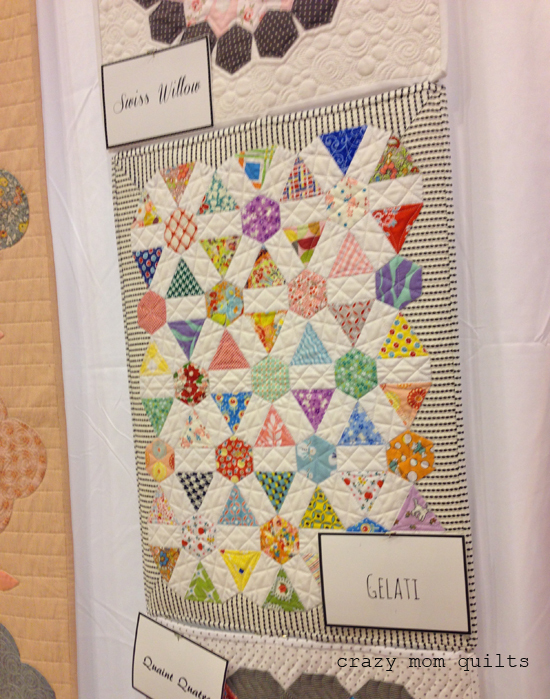 Such contrast to this quilt, but I like them both. That's it for me today! I hope you are having a great week! I'm not completely sure, but I think the month of May just might be the end of me. Man, it's been busy! If I've been sewing, it's mostly been something that I can't show yet. 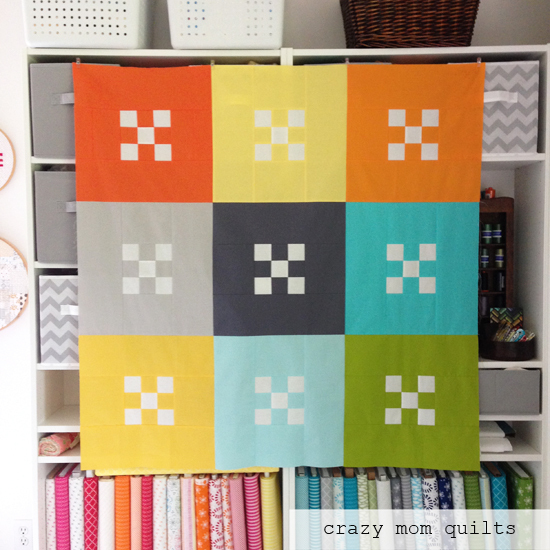 So, for sanity sake, I whipped up this little quilt top. I needed to see something completed, and quick like! Something bigger than a pincushion. Hahaha! 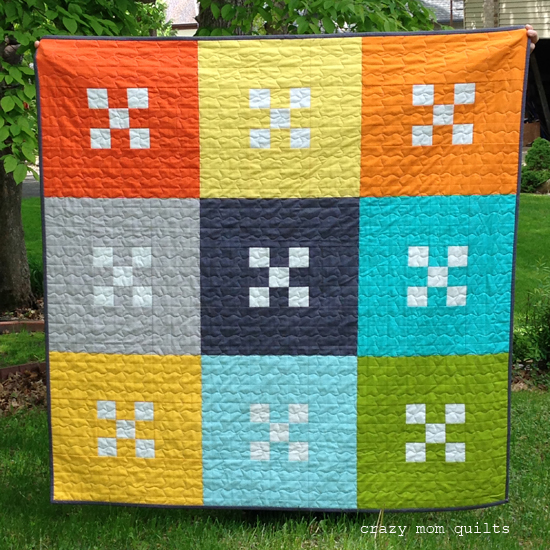 I used 10 different solid fabrics from my stash in this quilt. 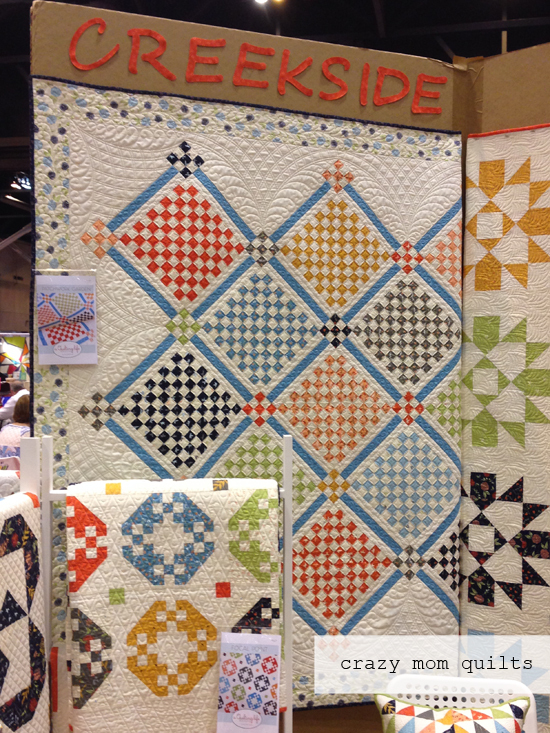 The white blocks are Kona cotton (Snow) and the solids are from a variety of different manufacturers, but mostly Kona. 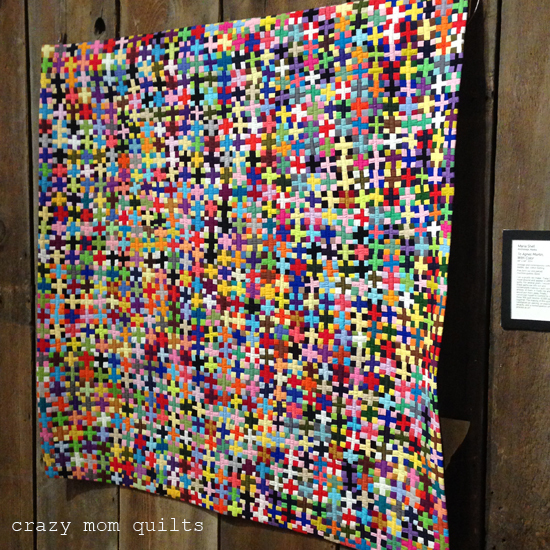 The blocks finish at 16", so the quilt should finish at about 48" square. 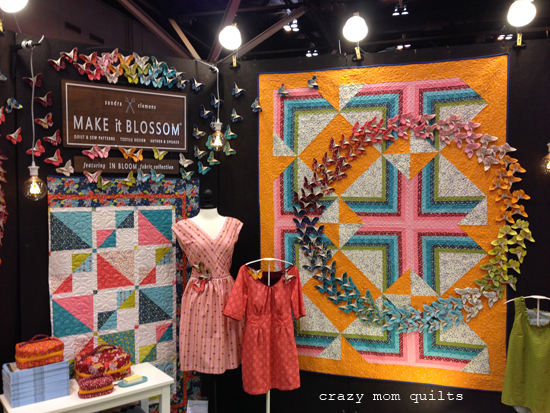 I'm excited because I already have a plan for quilting and binding. Figuring out a backing shouldn't be too hard. 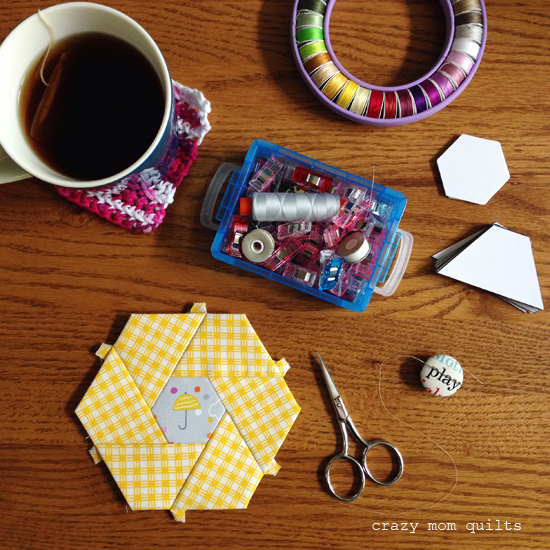 You can find the block tutorial here, if you care to make one of your own! I think this would be super cute done up in subtle prints, too. That's it for me today! Now, it's your turn. Please link up your finishes, and thank you, as always, for joining me for finish it up Friday! Well, I've started another WIP. That's a few in one week! It's a very good thing that I was on a finishing bender earlier this year. Ha! 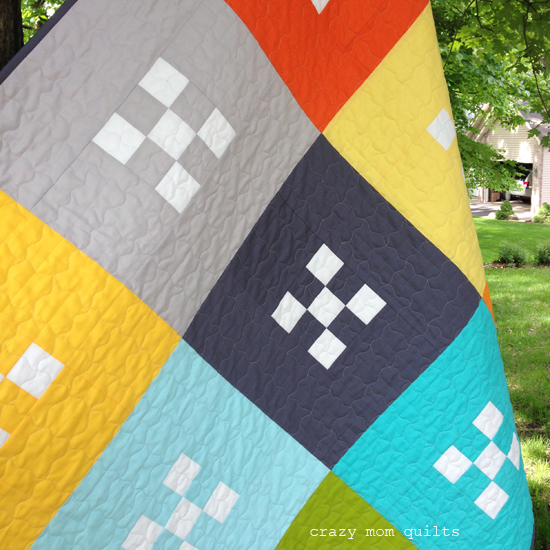 For this quilt, I'm using Kona shadow for the background and a variety of mixed substrate scraps for the triangles. 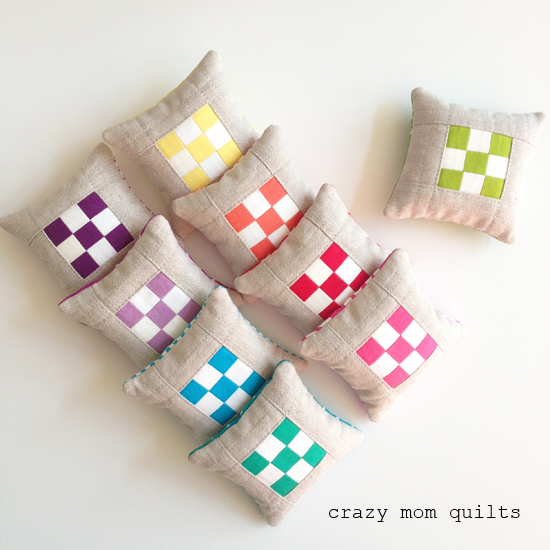 Many thanks to my friend, Anna, for the beautiful scraps! (Most of them are Essex linen, chambray, or lightweight denim.) 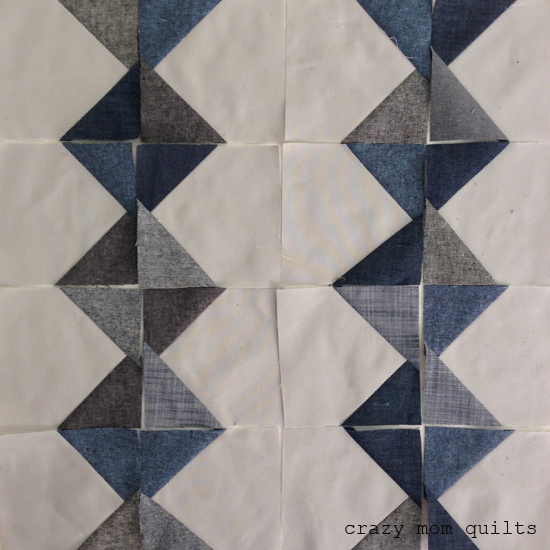 I love the pairing and the moody nature of this quilt so far! 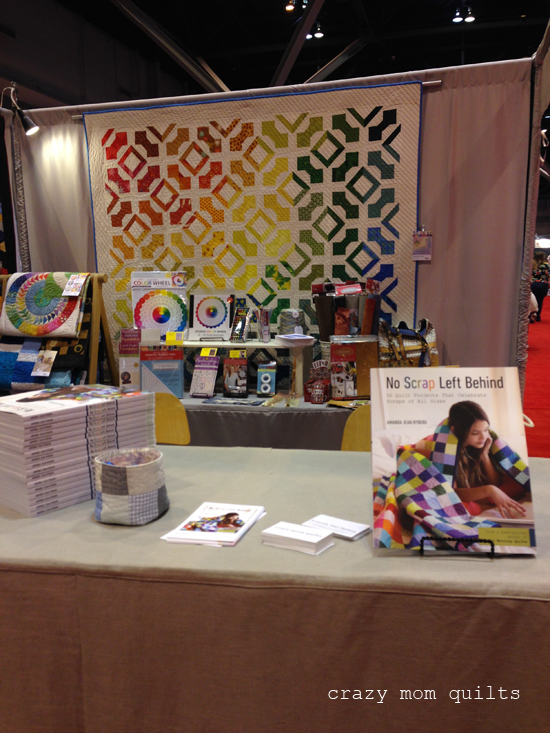 The pattern is based on my chain of diamonds quilt, which can be found in my book No Scrap Left Behind. 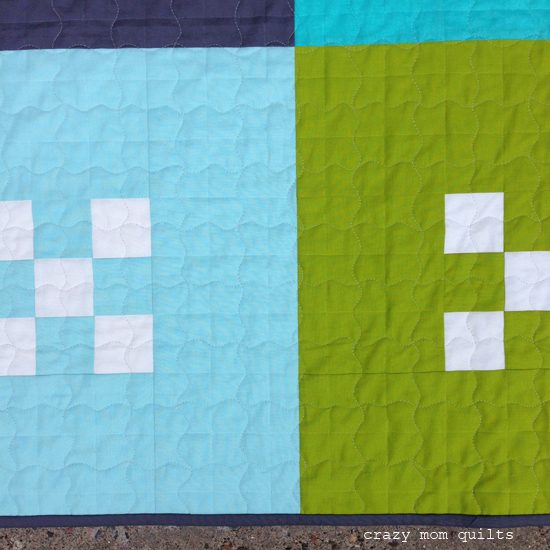 For this version, however, I upsized the blocks so I could finish this quilt sometime in this decade. :) I cut the background squares 4 1/2" and the triangles are made from 3 1/2" squares that were cut on the diagonal once. I may or may not add in some navy and very dark blue solids for a little more depth. 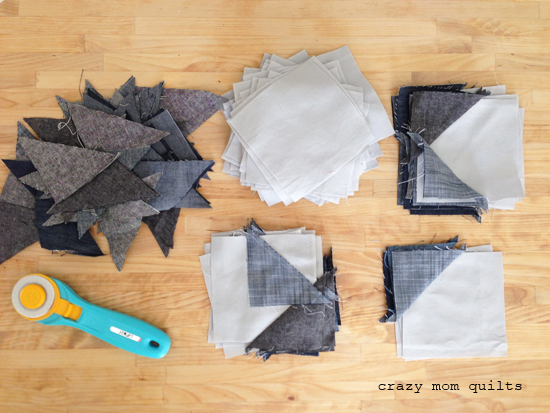 I get asked all the time, "If you always make scrap quilts, where do all the scraps come from?" That's a great question. 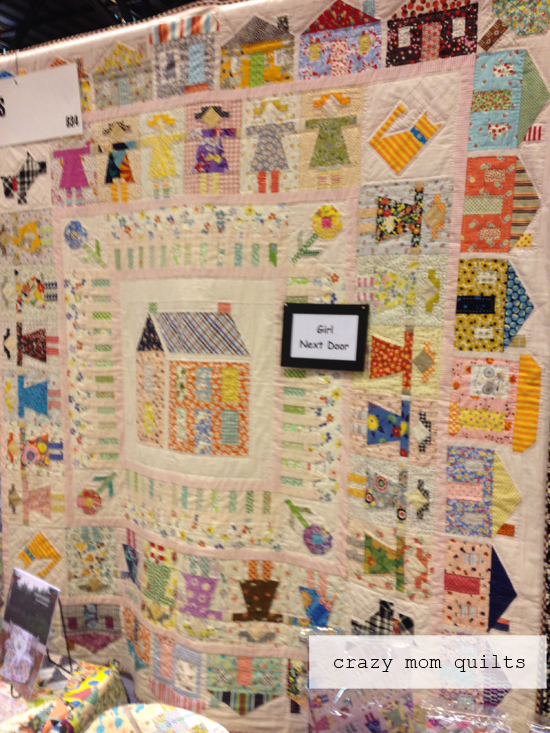 Many people pass along their scraps to me, and I enjoy sewing them up. 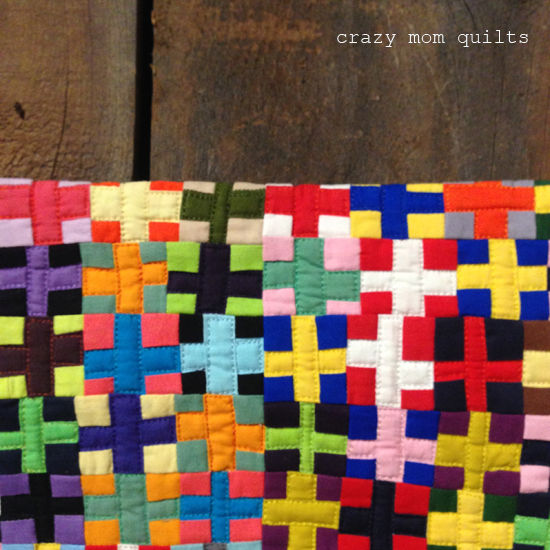 The other part of that answer is, I DO make quilts from the stash from time to time. Here's the start of one! 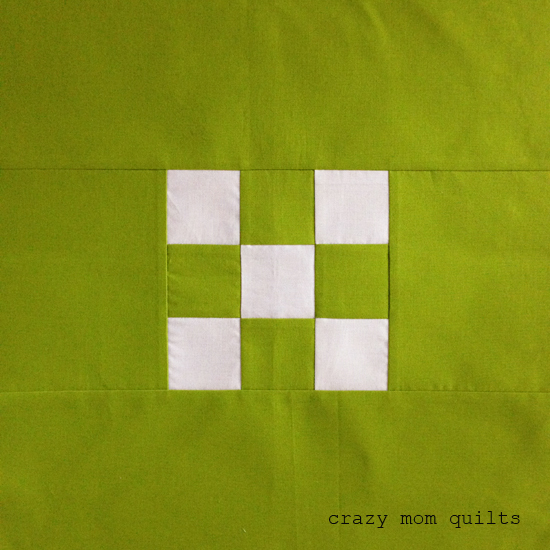 As much as I love tiny pieces and sewing up scraps, sometimes a "palette cleanser" quilt is in order. This is a super easy block that, while simple, is still big on impact. 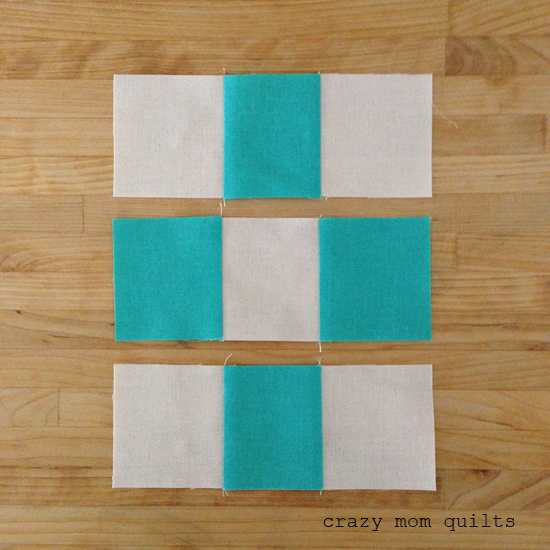 I thought I would share the measurements for the quilt block, in case you want to try one of your own. I bet you could whip one up in under 30 minutes! 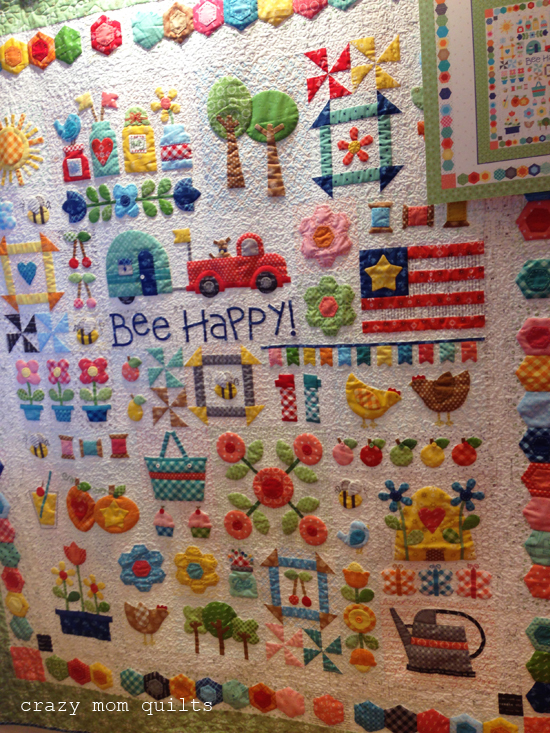 I didn't time myself making just one block, but I wish I would have. 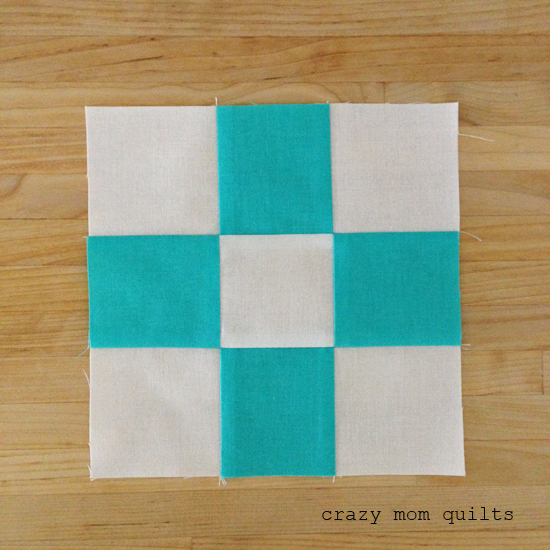 Cut 5 squares 2 1/2" x 2 1/2"
Cut 2 pieces 5 1/2" x 16 1/2"
Cut 2 pieces 5 1/2" x 6 1/2"
Cut 4 squares 2 1/2" x 2 1/2"
Sew 2 1/2" squares together into three strips, as shown. Press seams toward the darker fabric. 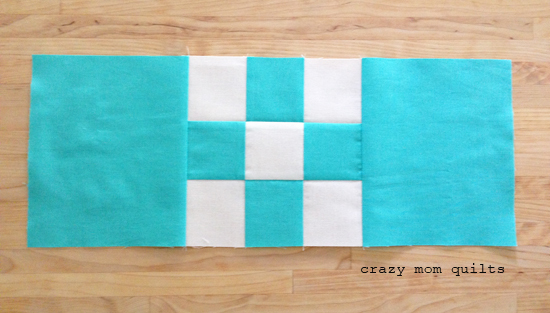 Sew 3 strips together to make a 9 patch block. Press seams toward the center strip of the block. (This will prevent as much shadowing as possible without pressing the seams open.) The block should measure 6 1/2" unfinished. 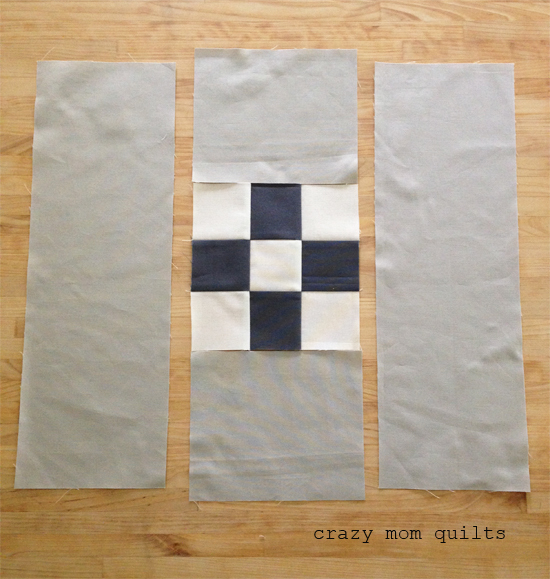 Sew the 5 1/2" x 6 1/2" pieces to either side of the 9 patch block. Press seams toward the outside of the block. 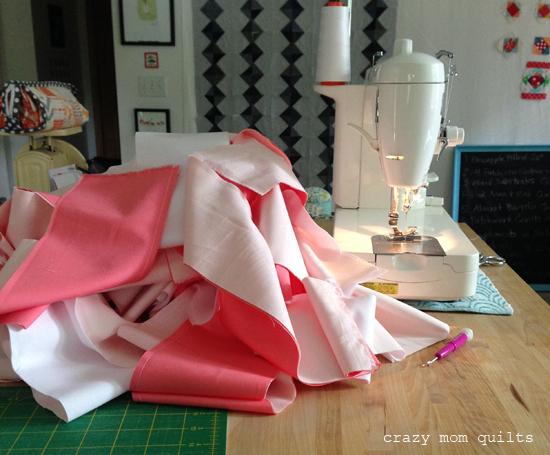 Sew the 5 1/2" x 16 1/2" pieces of fabric to the top and the bottom. Press seams toward the outside of the block. The block should measure 16 1/2" unfinished. When I was making the blocks this morning, it occurred to me that it would be fun to mix up the colors of the 9 patch and the borders. It would produce a fun, but different, look. So many possibilities! 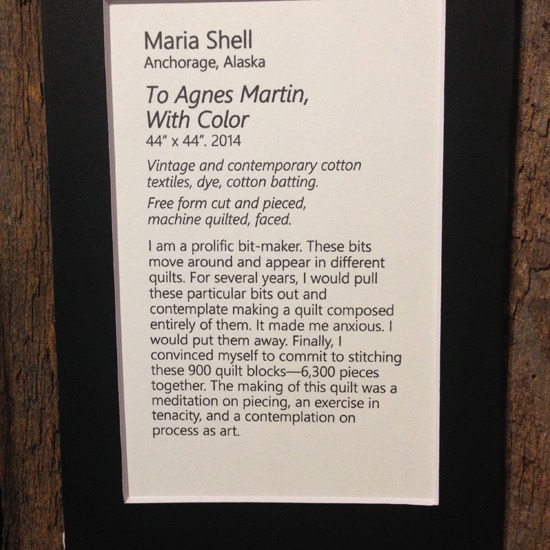 I had the opportunity to speak at teach at the Wisconsin Museum of Quilts & Fiber Arts in Cedarburg over the weekend. Many thanks to the wonderful students that attended my class and lecture on Saturday. It was a very fun day! The museum is a lovely little place in an adorable town that I've visited once before, when I took a workshop from Densyse Schmidt. The museum changes the display 4 times a year, I believe. 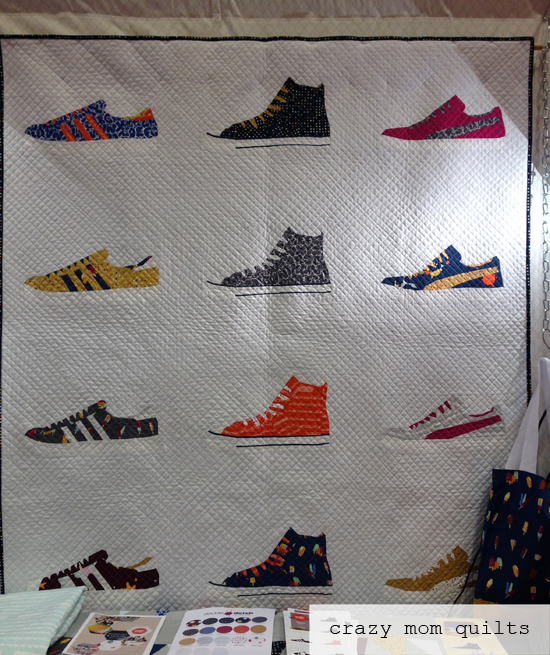 This quilt caught my eye immediately. It was absolutely stunning and it drew me in! 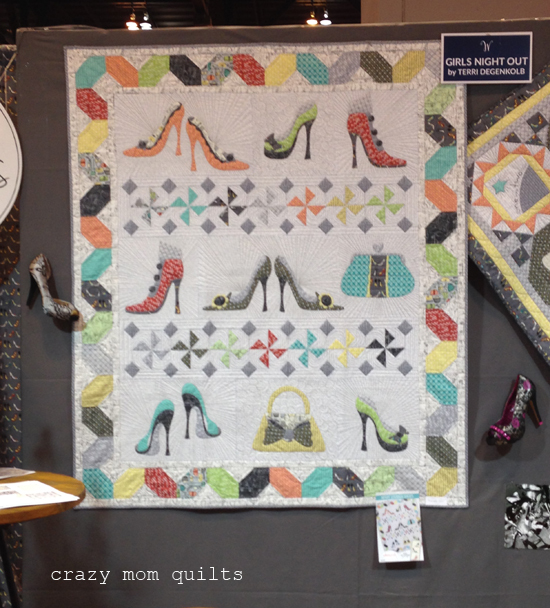 I've been dreaming of immersing myself in a study of scrap play in solid fabrics for months now, so this quilt really struck a cord with me. I don't think I'm going to go this tiny with my piecing, but I thought it was very inspiring! When I got home LATE Saturday night, I walked into a clean house, roses on the table and a pile of presents on the bookshelf. My family spoiled me for Mother's Day and it was a wonderful welcome home. 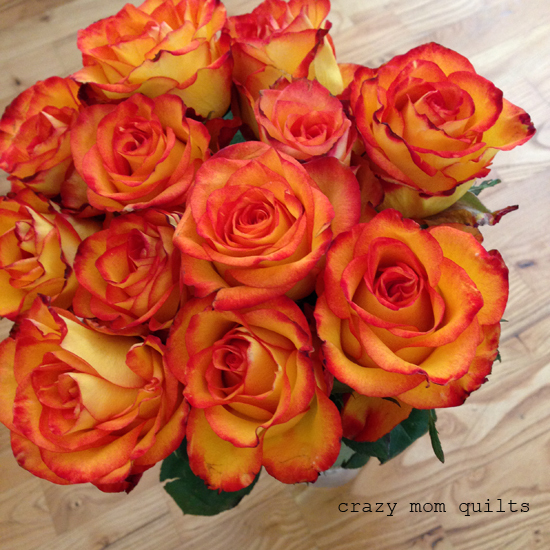 I hope YOU had a great Mother's Day weekend as well. I carved out some time to finish up the (9!) 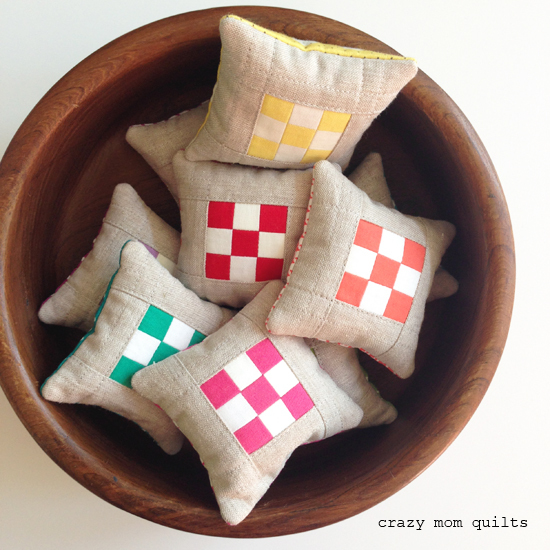 mini nines pincushions that I started a few weeks ago. 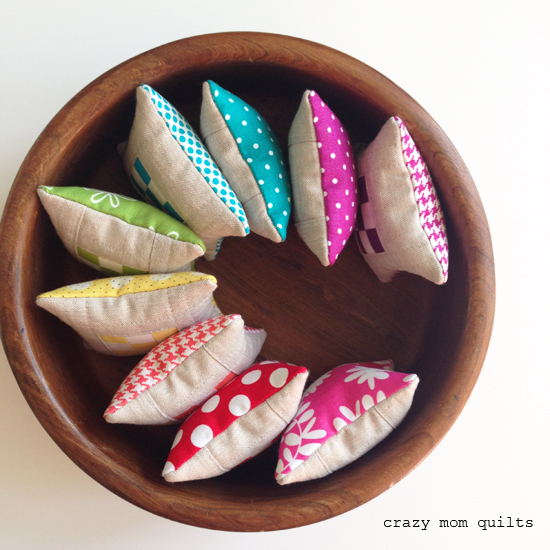 I really dislike production line sewing, but having this many pincushions to photograph at once makes it ALL worth it! 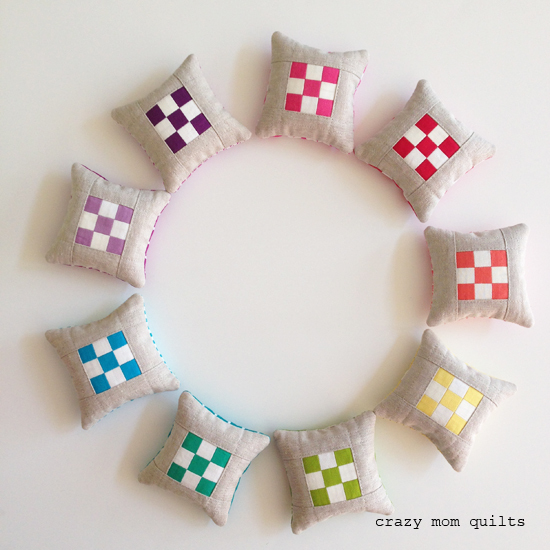 I love the combination of the bright solids paired with the natural Essex linen. 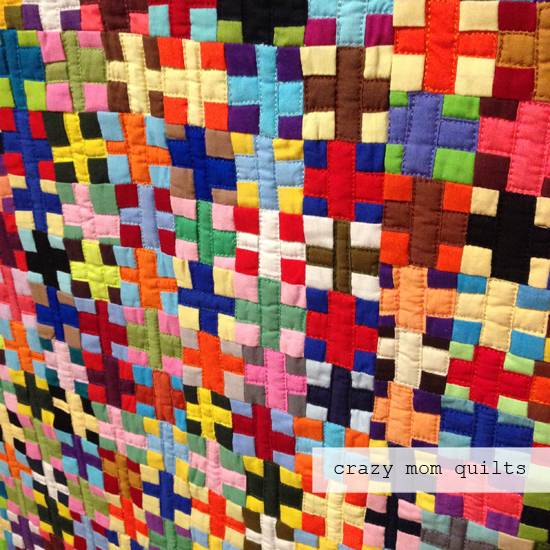 I'm ALMOST tempted to start another quilt like this.... almost! There is a tutorial here, if you'd care to make your own! 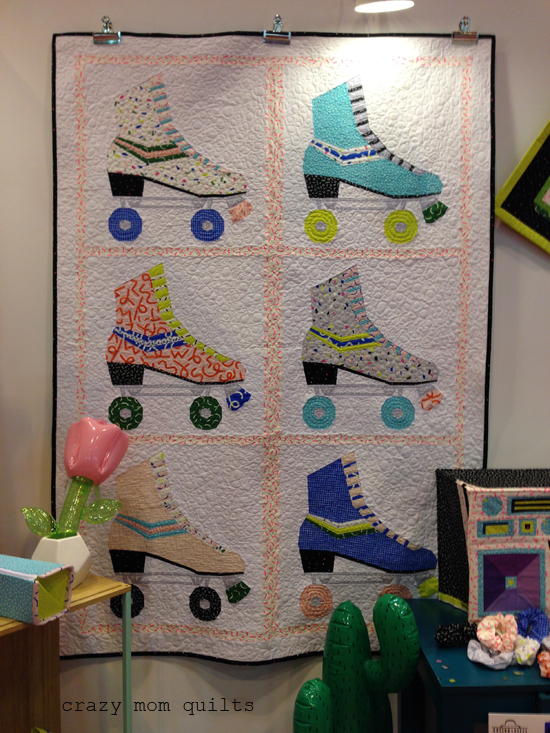 You can see the entire quilt I made from this block here. Now, it's your turn! Please link up your finishes for the week. I hope you have a GREAT weekend!